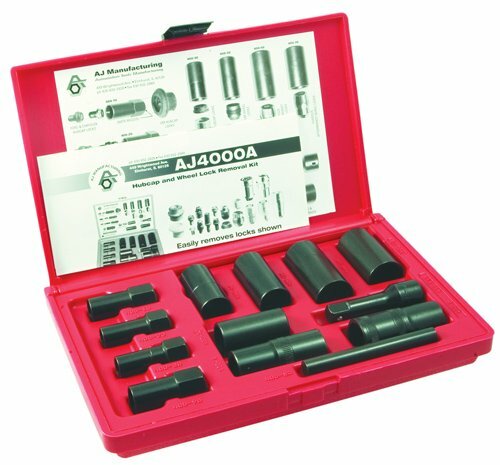 This kit features a durable red blow molded plastic case, and is used with a 1/2 inch drive ratchet wrench. The technician matches the correct socket for the application, and then gently taps the socket over the lock with a soft-face hammer. The gently tapered internal surface of the socket grips the lock’s surface, and when the turning force is applied to the ratchet wrench handle, the lock is loosened and removed. The 13-piece Deluxe Removal Kit includes 3/4 inches /19 mm and 7/8 inches twist sockets for removal of damaged lug nuts or oversized locks. An extractor punch is included to remove the lock from the socket.